"Bazu" redirects here. For the Romanian aviator, see Constantin Cantacuzino (aviator). The Bamileke is the native group which is now dominant in Cameroon's West and Northwest Regions. It is part of the Semi-Bantu (or Grassfields Bantu) ethnic group. The Bamileke are regrouped under several groups, each under the guidance of a chief or fon. They speak a number of related languages from the Bantoid branch of the Niger–Congo language family. These languages are closely related, however, and some classifications identify a Bamileke dialect continuum with seventeen or more dialects. The Bamileke are organized under several chiefdom (or fondom). Of these, the fondoms of Bafang, Bafoussam, Bandjoun, Baham, Bangangté, Bawaju, Dschang, and Mbouda are the most prominent. The Bamileke also share much history and culture with the neighbouring fondoms of the Northwest region and notably the Lebialem region of the Southwest region, but the groups have been divided since their territories were split between the French and English in colonial times. Variants of Ghomala' are spoken in most of the Mifi, Koung-Khi, Hauts-Plateaux departments, the eastern Menoua, and portions of Bamboutos, by 260,00 people (1982, SIL). The main fondoms are Baham, Bafoussam, Bamendjou, Bandjoun. Towards southwest is spoken Fe'fe' in the Upper Nkam division. The main towns include Bafang, Baku, and Kékem. Nda'nda' occupy the western third of the Ndé division. The major settlement is at Bazou. Yemba is spoken by 300,000 or more people in 1992. Their lands span most of the Menoua division to the west of the Bandjoun, with their capital at Dschang. Fokoué is another major settlement. 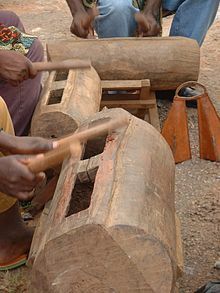 Medumba is spoken in most of the Ndé division, by 210,000 people in 1991, with major settlements at Bangangté and Tonga. Mengaka, Ngiemboon, Ngomba and Ngombale are spoken in Mbouda. Kwa is spoken between the Ndé and the Littoral region, Ngwe around Fontem in the Southwest region, and Mmuock (language) by the Mmuock people in the Lebialem division of the Southwest region. Bamileke belongs to the Mbam-Nkam group of Grassfields languages, whose attachment to the Bantu division is still disputed. While some consider it a Bantu or semi-Bantu language, others prefer to include Bamileke in the Niger-Congo group. The Bamileke speak a semi-Bantu language and are related to Bantu peoples. Historically, the Bamun and the Bamileke were united. The founder of the Bamun group (Nchare) was the younger brother of the founder of Bafoussam. Bamiléké are a group comprising many tribes. In this group, there are several superficial cultural disparities, including Dschang, Bafang, Bagangté, Mbouda and Bafoussam. During the mid-17th century, the Bamiléké people's forefathers left the North to avoid being forced to convert to Islam. They migrated as far south as Foumban. Conquerors came all the way to Foumban to try to impose Islam on them. A war began, pushing some people to leave while others remained, submitting to Islam. This marks the division between the Bamun and Bamiléké people. Bantu refers to a large, complex linguistic grouping of peoples in Africa. The Cameroon-Bamileke Bantu people cluster encompasses multiple Bantu ethnic groups primarily found in Cameroon, the largest of which is the Bamileke. In the 17th century they migrated further south and west to avoid being forced to convert to Islam. Another reason for migration was to resist enslavement during the Atlantic Slave Trade. Today, a majority of peoples within this people cluster are Christians. Germany gained control of "Kamerun" in 1884. The Germans first applied the term "Bamileke" to the people as administrative shorthand for the people of the region. The Bamileke are very dynamic and have a great sense of entrepreneurship. Thus, they can be found in almost all regions of Cameroon and in the world, mainly as business owners. In 1955, the colonial French power banned the Union des Populations du Cameroun (UPC) political party, which was claiming the independence of Cameroon. Following that, the French started an offensive against UPC militants. Much of fighting occurred in the West region, region of the Bamileke. Some tens of thousands of people died in the UPC conflict with French and Cameroonian troops. Statue of a chief at Bana. The Bamileke's settlements follow a well-organized and structured pattern. Houses of family members are often grouped together, often surrounded by small fields. Men typically clear the fields, but it is largely women who work them. Most work is done with tools such as machetes and hoes. Staple crops include cocoyams, groundnuts and maize. Bamileke settlement are organized as chiefdoms. The chief, or fon or fong is considered as the spiritual, political, judicial and military leader. The Chief is also considered as the 'Father' of the chiefdom. He thus has great respect from the population. The successor of the 'Father' is chosen among his children. The successor's identity is typically kept secret until the fon's death. The fon has typically 9 ministers and several other advisers and councils. The ministers are in charge of the crowning of the new fon. The council of ministers, also known as the Council of Notables is called Kamveu. In addition, a "queen mother" or mafo was an important figure for some fons in the past. Below the fon and his advisers lie a number of ward heads, each responsible for a particular portion of the village. Some Bamileke groups also recognise sub-chiefs, or fonte. Hut at the chefferie of Bana. Traditional homes are constructed by first erecting a raffia-pole frame into four square walls. Builders then stuff the resulting holes with grass and cover the whole building with mud. The thatched roof is typically shaped into a tall cone. Nowadays, however, this type of construction is mostly reserved for barns, storage buildings, and gathering places for various traditional secret societies. Instead, modern Bamileke homes are made of bricks of either sun-dried mud or of concrete. Roofs are of metal sheeting. During the colonial period, parts of the Bamileke adopted Christianity. Some of them practice Islam toward the border with the Adamawa Tikar and the Bamun. The Bamileke have worn elephant mask for dance ceremonies or funerals. The Bamileke trace ancestry, inheritance and succession through the male line, and children belong to the fondom of their father. After a man's death, all of his possessions typically go to a single, male heir. Polygamy (more specifically, polygyny) is practiced, and some important individuals may have literally hundreds of wives. Marriages typically involve a bride price to be paid to the bride's family. "Succession and inheritance rules are determined by the principle of patrilineal descent. According to custom, the eldest son is the probable heir, but a father may choose any one of his sons to succeed him. An heir takes his dead father's name and inherits any titles held by the latter, including the right to membership in any societies to which he belonged. And, until the mid-1960s, when the law governing polygamy was changed, the heir also inherited his father's wives--a considerable economic responsibility. The rights in land held by the deceased were conferred upon the heir subject to the approval of the chief, and, in the event of financial inheritance, the heir was not obliged to share this with other family members. The ramifications of this are significant. First, dispossessed family members were not automatically entitled to live off the wealth of the heir. Siblings who did not share in the inheritance were, therefore, strongly encouraged to make it on their own through individual initiative and by assuming responsibility for earning their livelihood. Second, this practice of individual responsibility in contrast to a system of strong family obligations prevented a drain on individual financial resources. Rather than spend all of the inheritance maintaining unproductive family members, the heir could, in the contemporary period, utilize his resources in more financially productive ways such as for savings and investment. [...] Finally, the system of inheritance, along with the large-scale migration resulting from population density and land pressures, is one of the internal incentives that accounts for Bamileke success in the nontraditional world". Donald L. Horowitz also attributes the economic success of the Bamileke to their inheritance customs, arguing that it encouraged younger sons to seek their own living abroad. He wrote in Ethnic groups in conflict: "Primogeniture among the Bamileke and matrilineal inheritance among the Minangkabau of Indonesia have contributed powerfully to the propensity of males from both groups to migrate out of their home region in search of opportunity". ^ "Bantu, Cameroon-Bamileke". Joshua Project. Retrieved 7 February 2019. Includes other non-Bamileke Semi-Bantu people. ^ "Cameroon: Treatment of members of the Bamileke tribe by the authorities, and the language spoken and written by this tribe". Refworld. Canada: Immigration and Refugee Board of Canada. Retrieved 10 June 2018. ^ Johnson, Willard R. 1970. The Cameroon Federation; political integration in a fragmentary society. Princeton: Princeton University Press. Toukam, Dieudonné (2016; first ed. 2010), Histoire et anthropologie du peuple bamiléké, Paris: l’Harmattan, 2010, 338p. Toukam, Dieudonné (2008), Parlons bamiléké. Langue et culture de Bafoussam, Paris: L'Harmattan, 255p. Fanso, V.G. (1989) Cameroon History for Secondary Schools and Colleges, Vol. 1: From Prehistoric Times to the Nineteenth Century. Hong Kong: Macmillan Education Ltd, 1989. Neba, Aaron, Ph.D. (1999) Modern Geography of the Republic of Cameroon, 3rd ed. Bamenda: Neba Publishers, 1999. Ngoh, Victor Julius (1996) History of Cameroon Since 1800. Limbé: Presbook, 1996. Knöpfli, Hans (1997—2002) Crafts and Technologies: Some Traditional Craftsmen and Women of the Western Grassfields of Cameroon. 4 vols. Basel, Switzerland: Basel Mission. Wikimedia Commons has media related to Bamileke.